The Sunshine icon pic above was created by Karilan. I was nominated for the Sunshine Blogger Award by Karilan. If you haven't checked out her blog, I think you should. It's full of awesome stories, and I particularly love how she includes the schedules in a sidebar on her blog. It makes it super easy to keep track of the stories I'm reading. A particular favourite story of mine is her legacy, How To Live With Grace. It's a legacy story about people finding their feet in the world. A truly inspirational read. 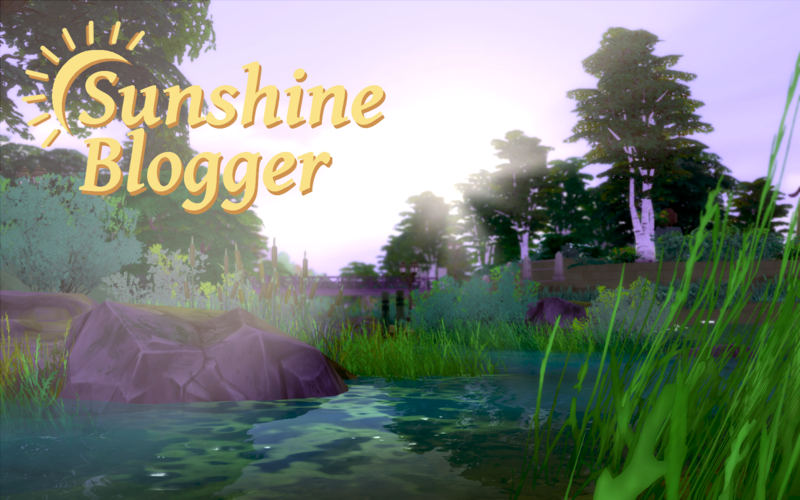 The Sunshine Blogger Award is given to creative, positive, inspiring bloggers who spread sunshine to the blogging community. 1. Has any of your writing been inspired by someone else’s SimLit? I was inspired to write my own action story when reading the Chagall legacy, which is a sims 3 legacy about a man who embarks on many exciting missions. The story that got me interested in writing sims4lit was Maladi’s Heffner Legacy, which showed me that you could write sims 4 action stories too, even though the sims 4 is not an openworld as is the sims 3. The story itself, however, was actually loosely inspired by the story of Alexander the Great and Hephaestion, but set in the future. I also put Hephaestion (Henry) on the opposing side to Alexander (Alex). 3. Do you spend an equal amount of time playing as you do writing? 4. Would you rather lay on the beach under the sun, or curl up in front of the fire in a snowy lodge? If I lie on the beach in the sun in NZ, I’d most likely burn and suffer the painful consequences both immediately and later in life. Hence, I think I’d prefer to curl up in front of a fire in a snowy lodge, given I have a book with me and the snow’s more like the snow on Mt. Ruapehu. (A place in NZ). 5. Have you ever recreated your own home in any Sims game? No, but I have created my cousin’s place on the sims 3, years ago. I thought their place looked cool, so I decided to have a crack at making it. It was one of the first homes I built on the Sims 3. 6. What do you do when you get stuck developing a character? 7. Has a story ever taken a turn you didn’t expect? What did you do about it? Actually yes. Paris was never meant to play the role he/she’s in now. Yes, Paris was supposed to be the Grandmaster vampire, but Paris wasn’t supposed to be Alexander’s main enemy. It was obvious when I decided to write a very loose variation of the story of Alexander and Hephaestion that Paris was going to play a certain enemy of Alexander, but I was in denial simply because I didn’t want Paris to have the same fate and endure the same tragedies, because I loved that sim. Now it’s coming to that point in the story where I can’t deny Paris’s plotline and role anymore. It’s a good thing, however, that Paris is playing this role, becuause he/she offers a new perspective on this character that hasn’t necessarily been explored before. Paris is a much more sympathetic character than the historical one and I plan to explore more deeply Paris’s reasons and justifications for some of the unpopular decisions that the historical/classical figure was said to have made. I am also tempted to write a twist on his/her fate. 8. Have you ever tried to rewrite an old story from a new perspective? That’s sort of what I’m doing here. I am roughly echoeing the story of Alexander the Great from the perspective of his best friend Hephaestion, although I am setting it in the future and placing Hephaestion on the opposing side. Hephaestion is my favourite historical figure in the tales of Alexander the Great. I realise, if you know the story of Alexander, you’re possibly wondering why Hephaestion when there were so many other awesome characters? It’s because Hephaestion seemed to get away with things Alexander’s other friends did not get away with. He could challenge Alexander and not get murdered. Okay, he did get threatened with being killed by Alexander once in Plutarch’s version of the story, where he and Craterus were arguing and drew swords. That’s when the famous argument happened where Alexander tells Hephaestion that he would be nothing without him. Pretty cruel, but I think Alexander was just extremely worried about losing his two closest companions and got a bit emotional. (Of course it could just be Plutarch dramatising things since ancient historians usually did that XD). But as far as we know, Hephaestion was never murdered, which is odd because he was probably one of the least popular members of Alexander’s army. According to Arrian, that’s because everyone was jealous of his relationship with Alexander. Not sure if we know that for sure. I am by no means a classical historian, but I bet Hephaestion was a manipulative little ‘so and so,’ having been one of the main members to have called out potential plotters against Alexander. Furthermore, if anyone could get Alexander to do what they wanted, it was Hephaestion, hence he was the one who persuaded Alexander into torturing Philotas into confessing he was plotting against the king. He was also sometimes made General of one of the armies, despite being unskilled in the area. However, he was either co-leader or appointed a smaller army. But talk about a 'mateocracy' XD. His bust (yes he’s so special he had his very own bust made for him) is also very handsome. He was actually considered drop-dead gorgeous and was apparently really tall. (Yeah, that might have been an exaggeration on the ancient historians’ part, but from looking at the bust, it could certainly have been the case). In fact, there’s a theory held by some modern historians that uses Hephaestion’s exceptionarily good looks as an argument for why Alexander might have been in love with him. (Not kidding). 9. Bella Goth is one of my favorite of EA’s townies that jumps between each of the games. Have you ever played her and given her a different life than EA’s mystery? The first and only time I played Bella Goth was years ago when I was playing the sims 1. I would definitely have given her a different life than EA’s mystery, because I didn’t know about it untill I started playing the sims 2. 10. Think about someone who makes you smile. Who is it? 11. If you could sit down with any of your characters for an hour, who would it be, and what would you ask them? What do you think makes a good character? Do you find the writing process challenging? If so, what particularly challenges you? What part of the writing process do you particularly enjoy? How important is the reader’s reaction to your plot and character development? What’s the most surprising thing a character’s ever done? Think about someone who makes you smile. Who is it? If you had to be stranded on a desert Island, which of your characters would you want to be there with you and why? Which of your characters is most likely to win ice curling in the Winter Olympics? Which of your characters/pet would take the opportunity to live on Mars? What plotline has surprised your readers the most? What video game does your sims enjoy playing the most?